this is project thirty-seven of fifty-two projects. to see other completed projects, click here. project thirty-seven: track down a picture of every place you have ever lived. not the geographical location but the physical structure you called your home. clearly it's christmas. i won't lie to you and say this is my first home. my first family house was in brampton, near etobicoke/toronto where i was born. my only memory of the brampton house is eating baby bell cheese by the fireplace. 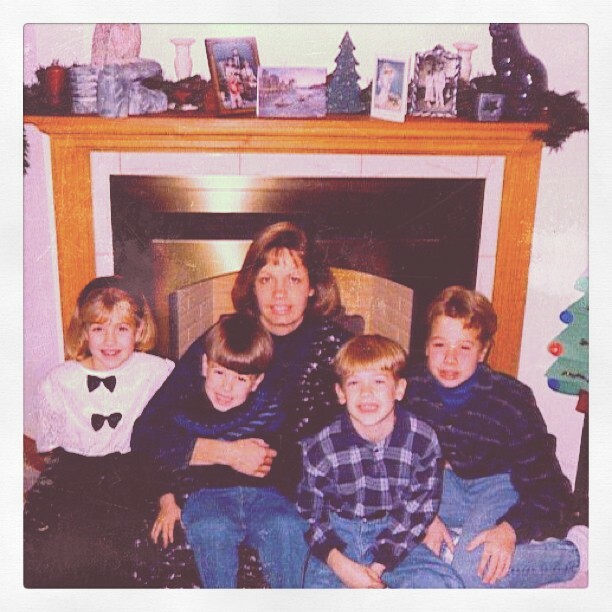 speaking of fireplaces - the one above is the backdrop to our family christmas photo in our townhouse on wilson drive. those are my three brothers (or should i say monkeys?). and i'm pretty sure my mom made that ceramic glazed cat on the mantle. i guess my father is taking the picture! in case you missed that, we moved across the street when i was in grade seven. 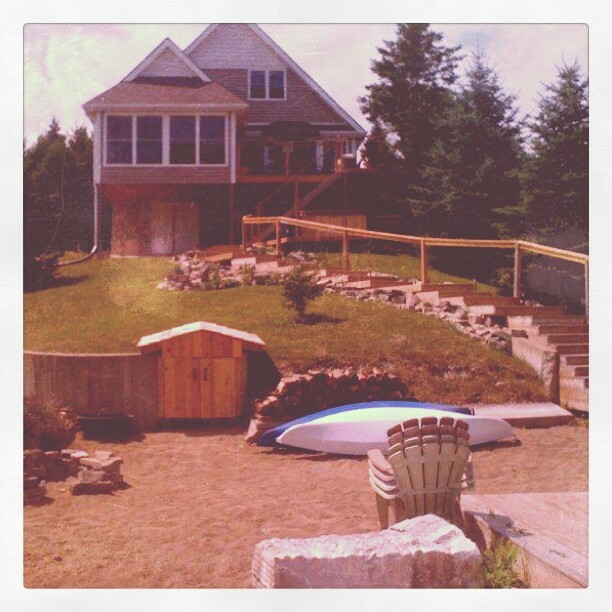 we were big fans of this house because it had two washrooms and a huge backyard. i had lots of parties there in the summer. in the above photo i am dressed for my grade eight graduation. i thought it was grown up to have short hair so i chopped it all off right before grad. 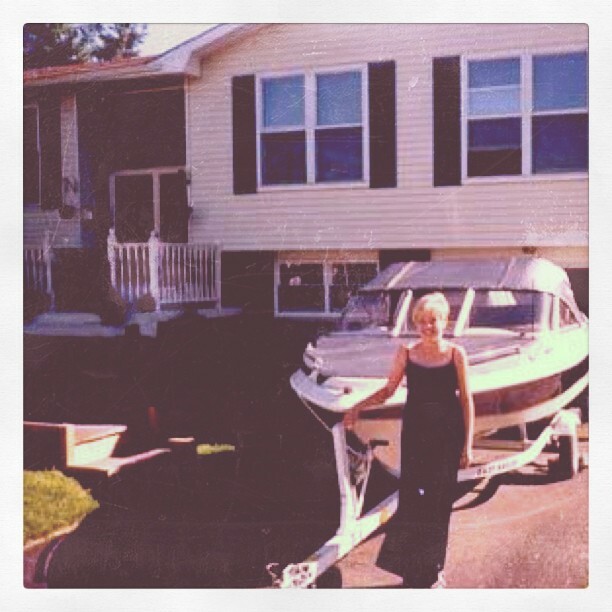 you can bet your bottom dollar it was my father's idea to have me pose with the boat. 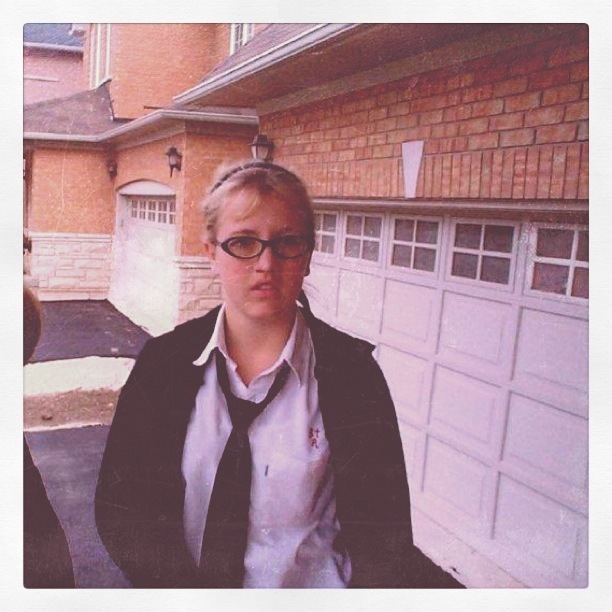 gosh, it was such a toss up between posting a picture of the actual facade of the house, and this picture of me standing by the garage looking like a total dork in my high-school uniform. i didn't even need glasses. i love love loved this house because my parents let me have the biggest bedroom upstairs with an adjoining bathroom. we all called it "my little apartment." and it always felt like one. 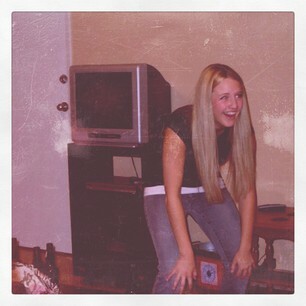 my dad agreed to paint one wall RED and that + the bathroom meant i was one happy teenager. except when my brothers would bust into my room - because for a long time i had no lock on the door. this is my dorm room in university and that is my roommate heather. the night before my birthday my roommates surprised me with an impromptu party at midnight, hence the lei around my neck. 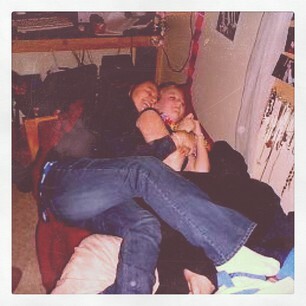 it's always been a big joke (read: annoyance) with my friends that i am not much of a hugger so when the clock struck midnight, heather attacked me with a full body hug. this was my first real grown up digs. i shared this apartment with four other girls who were all in the same university dorm with me. we felt pretty mature but in reality this apartment did not deter us from acting like total goofs 24/7. in the above photo i'm attempting to do that knee switch dance move at one of our parties. apparently i like baby steps because this time i only moved up one floor. exact same floor plan, but backwards. this time it was three girls and two guys, a much more subdued combo indeed. on this particular night they took me to see the rick mercer show live for my birthday (really? you don't know who that is? he's the canadian jon stewart!). 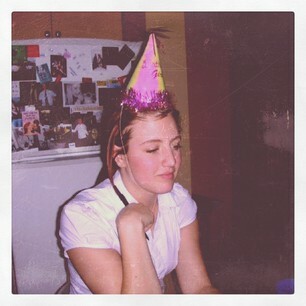 when we got home they put a party hat on me and we played "would you rather?" 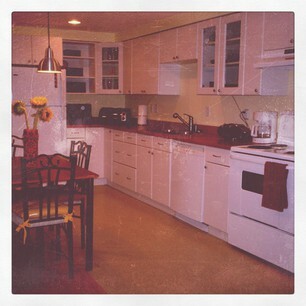 god, j and i were so incredibly happy to walk into this basement suite when we moved to victoria. since we didn't get a chance to see it in person, we were expecting the worst. i remember when we walked in at 11 pm on august 31, 2008. we saw this giant kitchen, squealed in unison and then j picked me up and spun me around till we both got dizzy. 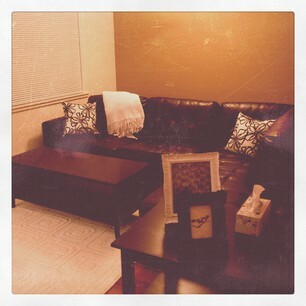 this is a picture i took of the living room when j and i moved into our current apartment in victoria. aside from "my little apartment" in the abbott house, this is probably my favourite home yet. it's a cool set up and perfect for me and my handsome husband. the only thing missing from this picture is miss carefree (she was delivered a little bit later). i wish i could show you a picture of this cottage. it was shaped really geometrically and my father built it himself which is cool. i practically lived here in the summers of my childhood. 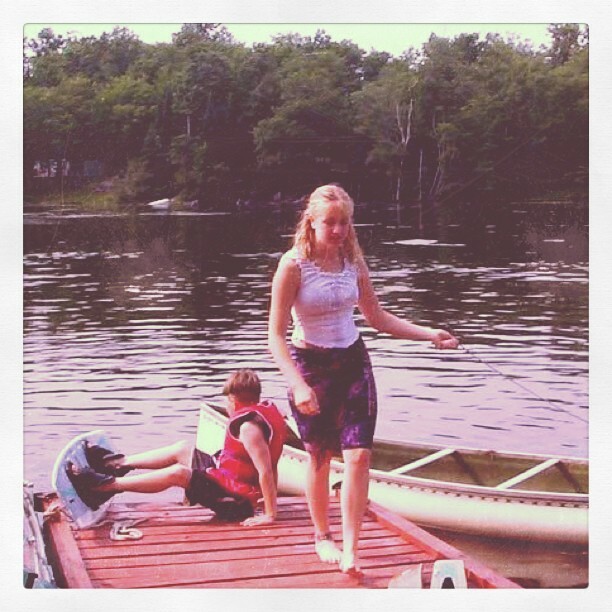 but i didn't want you to miss out on this wicked picture of me at the dock. what am i wearing? i don't know. which brother is that? it's anyone's guess! 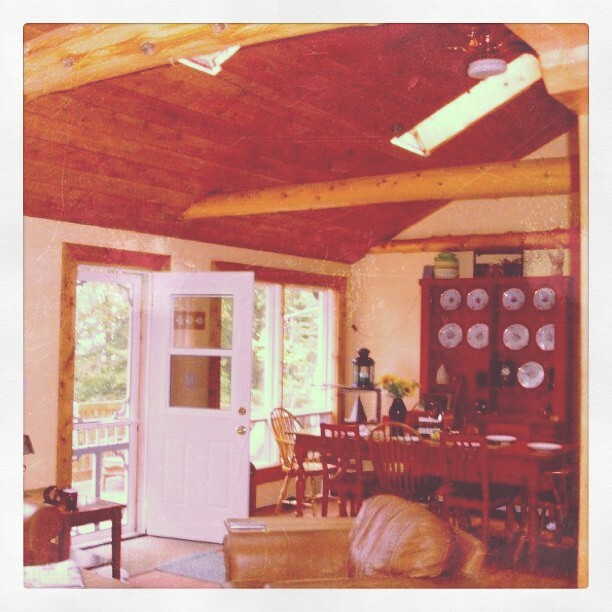 this is the second cottage my father built. it's neat because i went up each year with a group of friends and each time we arrived there would be more finished. 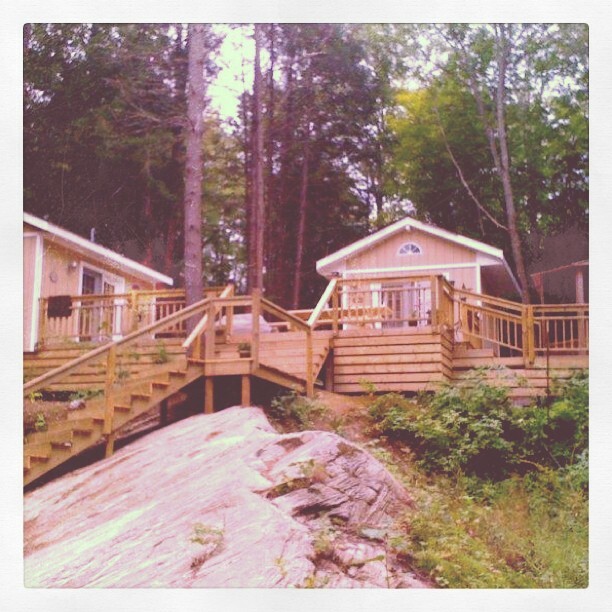 the first year we went it was just a deck and we camped out. the last year we went up here it looked like this! see that rock there? before my dad built all that stuff (including the stairs), you had to walk along the precipice of that rock in order to get down to the water. oh the stories that rock could tell...it has seen many a good person go down depending on drunkenness, speed, weather and darkness. I am 98% sure that's my shirt you are wearing the first severn river cottage photo. That, or we had the same shirt! This is a great post. thanks for your comment, i love hearing your thoughts! 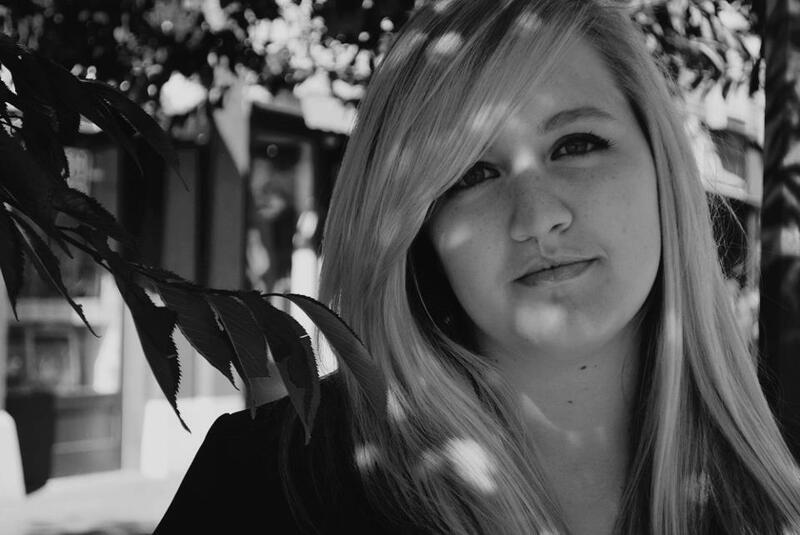 kaitlyn patience is a creative professional with a passion for the arts, community engagement, and the contemporary craft movement. here you'll find modern art features, stationery and snail mail, and the musings of a new mother.